A great product just got better! Clear PowerTape banner hem reinforcing tape has a clear base film instead of the white film of Original PowerTape, resulting in some great new benefits. Banner Ups® Clear PowerTape is a single-sided banner hem reinforcing tape. Unlike ordinary double-sided banner hem reinforcing tape, there is no need to fold a hem in the media to reinforce banner edges. Just apply Banner Up Tabs on the corners, then simply strip PowerTape banner hem reinforcing tape along the top and bottom edge of the back of the banner, then punch holes through the tape, tabs, and media with a Banner Ups PowerPunch. Make banners in 1/5th the time of traditional methods (3 minutes vs 15 minutes)! And the banners you make will be double the strength. Watch the videos below to see how! PERFECT for double-sided banners – let’s the banner graphics shine through! IMPROVED DURABILITY – Withstood up to 99 mph in Wind Tunnel Testing! Recommended as banner hem reinforcing tape for outdoor banners more than 8 feet in length. When used with PowerTabs® apply tab first. PowerTabs® banner hem reinforcing tape will not stick over Clear PowerTape® because the tape has a silicone release coating. 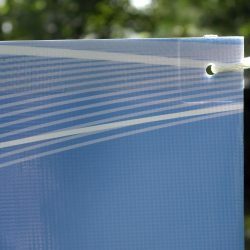 Clear PowerTape® banner hem reinforcing tape may be used along sides of vertical banners to reduce edge curl. Features: Use Clear PowerTape with PowerTabs to create ultra strong banners. What is the difference between Clear PowerTape® and PowerTape® banner hem reinforcing tape ? The Clear PowerTape is now clear instead of the original white. Great fro double sided banners allowing images to shine through. It’s also stronger and lower cost than the original PowerTape. 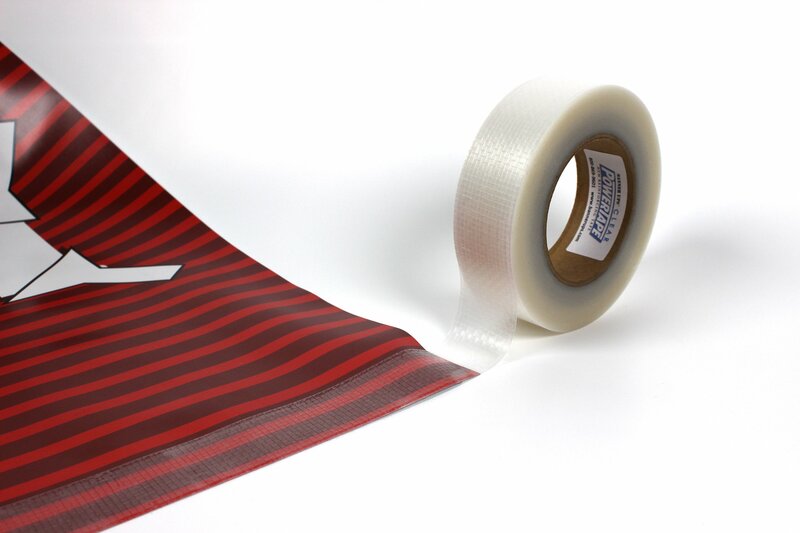 What is the difference between Clear PowerTape® and typical double sided banner hemming tape? The first difference is that Clear PowerTape® is not double sided. It is a single sided tape, but it is made with a super strong film so that you get the strength of a hem without the hassle. With regular double sided banner hemming tape, you must lay down tape all along the edge of the banner, then carefully fold the fabric and press it against the tape. Most people find this to be a real pain! It takes some practice to get it right, plus, if you mess up you have to start all over or the hem looks awful. How do I use Clear PowerTape®? Clear PowerTape® is a single sided tape that comes on a convenient self wound roll. To use it you simply lay the banner face down on a table, apply PowerTabs® and strip Claer PowerTape® along the top and bottom edge of the unfinished banner on top of the PowerTabs®, punch a hole through the tab center hole, the tape, and banner media. Then, fasten your rope, and you are ready to go. It may seem obvious, but the tape goes on the back of the banner. Do I put the Clear PowerTape® banner hem reinforcing tape on the banner first, or the PowerTabs®? It is very important to put the PowerTabs on first, followed by the Clear PowerTape®. Why? Because the tape has a silicone release coating on it to make self wound rolls possible. As a result, if you put the Clear PowerTape® down first the tabs will not stick to the PowerTape®! Try it and see. 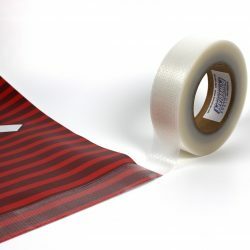 If you discover a situation where you really want to adhere the tabs over the tape, you may dissolve the silicone release coating from the surface of the Clear PowerTape® by gently rubbing the tape film surface with a rag soaked in nail polish remover (don’t overdo it – it could melt the plastic film too!). This will quickly remove the silicone release coat and adhesive will stick to it. 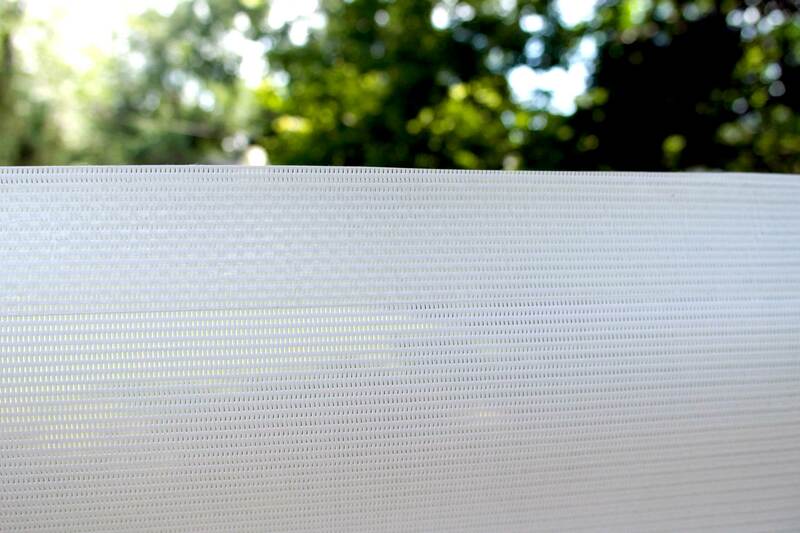 Should I use Clear PowerTape® banner hem reinforcing tape on all four sides? We normally do not recommend this. Clear PowerTape® works just fine when used only along the top and bottom edge. That said, some customers desire extreme strength for extreme conditions. They have used the above nail polish technique to allow overlapping the tape at the corners and lay Clear PowerTape® on all four sides of the banner. You may apply tape along the top and bottom edge, then dissolve the release coating within a couple of inches of all four corners, using the nail polish remover as described above, then run a strip along both vertical edges, overlapping on the newly cleaned corners. Finally, apply the PowerTabs® at the corners over the 3-layer sandwich of banner fabric and two layers of tape, punch a hole through the center hole of the tab and the tape layers, fasten your rope through the hole and, COME ON WIND! 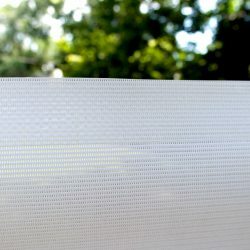 Do I have to run Clear PowerTape® banner hem reinforcing tape all the way along the edge or can I just run it a foot or two from the corner and still get the same strength? There is virtually no value to running Clear PowerTape® only a short distance from the corner without going continuously to the other corner. The secret to the strength of the Claer PowerTape® is the way it evenly distributes wind stress along the entire top and bottom edge of the banner and the ropes supporting the banner so that no one area takes too big a portion of the wind load. Should I use Clear PowerTape® for outdoor banners only, or for indoor as well? 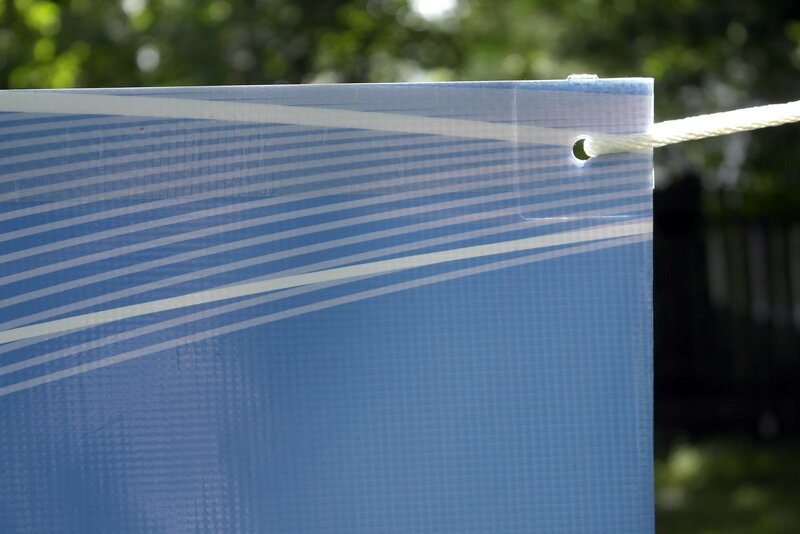 Clear PowerTape® is normally needed on outdoor banners only when the greatest strength is required. If you are not sure if the banner will be used indoors or out it may pay to use Clear PowerTape®. Clear PowerTape® has an added benefit even for indoor banners in that it gives some stiffness to the banner edge and helps reduce edge curl. Can I use Clear PowerTape® banner hem reinforcing tape by itself, without PowerTabs®? It is possible, for indoor banners, but definitely not recommended for outdoor banners. 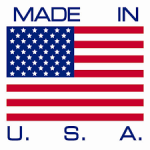 Clear PowerTape® has only moderate strength when used by itself, but tremendous strength when used over PowerTabs®. Can I use Clear PowerTape® with grommets without PowerTabs®? PowerTabs® and Clear PowerTape® are designed to be used as a system and when used correctly give strength far in excess of grommets alone. Some customers will simply use Clear PowerTape® in place of double sided tape and then install grommets without using PowerTabs®. This will give some additional strength, but not nearly as much as with the tabs.